Updated 4:45pm on 5-04-12 - GREENVILLE - Nearly a year after its birth and 10 months following a massive naming ceremony, Native Americans and fellow community members mourn the loss of Lightning Medicine Cloud. Officials confirmed in a press conference Friday that the rare white buffalo, along with his mother, were found dead this week at the Lakota Ranch, west of Greenville. “My people; my brothers, my sisters are hurt for what has happened here on this ranch,” stated an emotional Arby Little Soldier, Lakota Ranch owner. Little Soldier went on to announce that his family is offering a $5,000 reward for information leading to the person or persons responsible for the deaths of Lightning Medicine Cloud and his mother. Little Soldier, along with law enforcement officials, however, would not comment on how the animals were killed. Meeks went on to say that no motive has been determined and no crime classified. He did not comment on several questions, citing the ongoing investigation, including if the hide had been taken from the white buffalo. 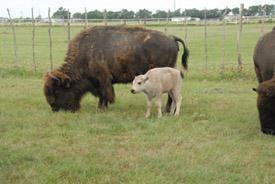 KTVT-TV had cited news sources in its report that the white buffalo was found butchered and skinned. According to the Ranch’s website, the father of Lightning Medicine Cloud, Ben, was killed after being struck by lightning during the string of storms that swept through the region April 3. “We believe it [Ben] was struck by lightning. At this time we don’t believe there is a connection between the other deaths,” Meeks added. Next week's Native American Powwow for May 11 and 12, which had been scheduled at the ranch to celebrate Lightning Medicine Cloud's first birthday, will still be presented. Anyone that has information into the deaths is urged to contact the Hunt County Sheriff’s Office at 903-453-6800. The Greenville Herald-Banner's Brad Kellar contributed to this report. The sacred white buffalo, said to be a one in 10 million occurrence, was days away from his first birthday. The press conference will take place at the Lakota Ranch, located west of Greenville along Highway 380. Sources tell KTVT-TV that Lightning Medicine Cloud was was found butchered and skinned on Monday. The next day the buffalo’s mother was found dead. The Greenville Herald-Banner first reported the investigation at the ranch Thursday afternoon. It was nearly 10 months ago that the Lakota Ranch was the site of a ceremony honoring the birth of a sacred white buffalo, which holds great significance to Native Americans. The site is also scheduled to host the 18th Annual Greenville Scholarship Native American Powwow on May 11 and 12, which has grown to include the celebration of Lightning Medicine Cloud’s birth. Update: Sacred white buffalo killed? GREENVILLE - Details remain vague in what is believed the death of a rare white buffalo, born nearly a year ago at the Lakota Ranch near Greenville. GREENVILLE - The Hunt County Sheriff’s Office is expected to release additional information into an ongoing investigation of the death of a livestock animal west of Greenville.